Self Hypnosis Titles Just $1 each! 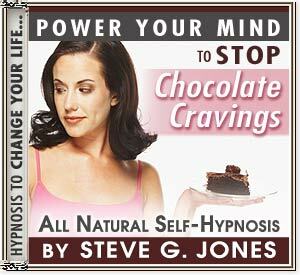 YOUR SUBCONSCIOUS MIND HOLDS THE KEY TO OVERCOMING ADDICTION TO CHOCOLATE! It's easier than you think. This Product is Backed by a Full 60 Day Money Back Guarantee!!! Dr. Steve G. Jones M.Ed. is a graduate of the University of Florida and is certified as a Clinical Hypnotherapist by the National Guild of Hypnotists and the American Board of Hypnotherapy. This program was recorded and mastered in a professional recording studio in GA by world-class engineers using state-of-the-art digital technology. Copyright © TEXT Statbrook Associates LLC In Partnership With Dr. Steve G. Jones M.Ed. Copyright © TEXT Statbrook Associates LLC In Partnership With Dr. Steve G. Jones M.Ed. All rights reserved.